It's great to be here again. I was saved by 7-11 after struggling to wring some cash from the ATMs at Taoyuan International. Black milk tea and sticky rice stuffed with radish and pork. Hail 7-11, savior of the hungry traveler. It all came back to me on the frigid bus ride to the city. The betel nut shops with the babes in the windows, the factory stacks barfing steam, the dirty little canteens with blackened woks and fogged glass cabinets stacked with steamed buns. It felt like coming home. After downing a tall boy of Taiwan Beer, we set out for 21 Goose and Seafood a couple of MRT stops from our home base in Zhongshan. 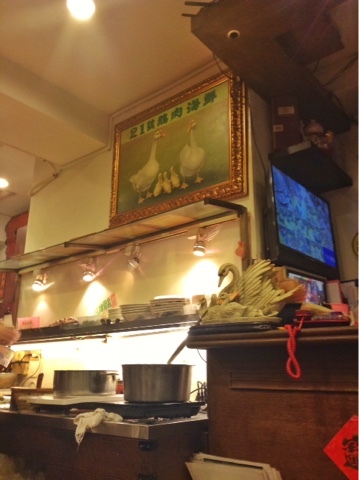 It's a tiny place with low lacquered tables where the patrons sit on small, wobbly stools. There's a case of halved roasted geese in front and mountains of fresh greens, tanks full of shrimp. The place is wallpapered with ads for single malt scotch. We ordered another bottle of Taiwan Beer and I was glad to see the mini glasses that everyone uses around here when sharing a bottle. 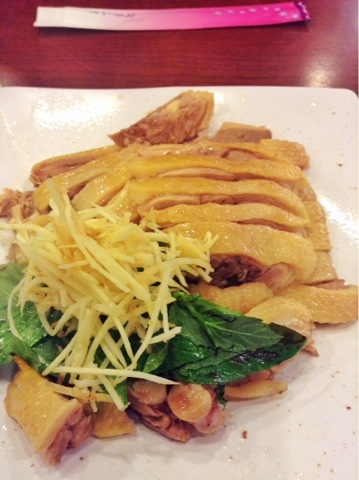 The special goose was incredible, served with ginger threads, basil leaves and a fermented bean/chili sauce for dipping. 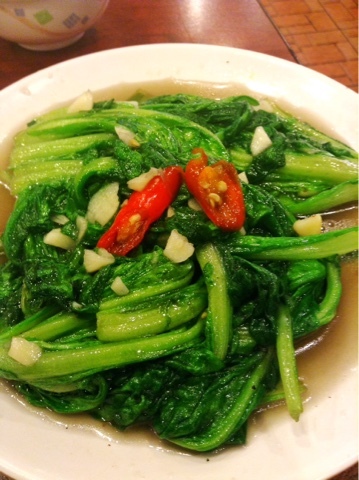 The stir fried greens were smoky from a blazing hot wok. I can never get my wok at home hot enough to reproduce the fabulous flavor of cooked greens in these parts. 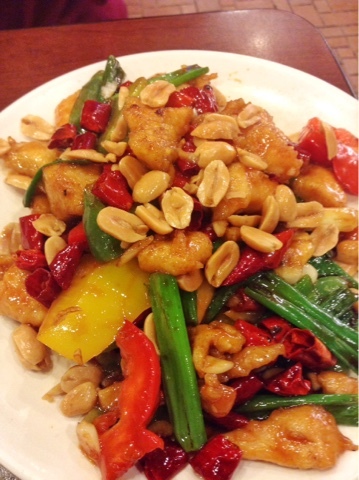 The gong bao chicken was crowded with dried chili and sang with heat and garlic. Yes, this is my kind of eating, good people. We'll have to try the seafood next time. Inspired by the reddened faces and empurpled noses of the diners neighboring us, we went to 7-11, grabbed a couple of tall boys and repaired to the nearest MRT station. We sat on the steps across from a shaggy group of drunk guys and watched a fellow in an adjacent shop wilting what looked like fresh tea leaves (not really tea season) and selling steamed buns in paper sacks. I love this city.